Pirates Recent Skid: Who’s to Blame? I was 5 years old the last time the Pittsburgh Pirates made the playoffs. What’s more, that was also the last time the team had a winning season. It would make the franchise look pretty bad if I were 12 right now. Eight-straight losing seasons would be rough. 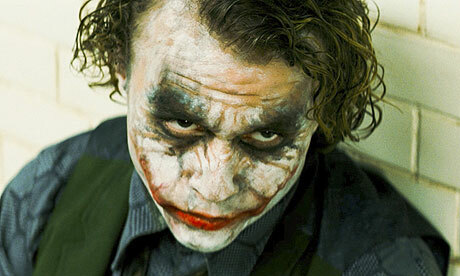 It would make it look eyebrow-raisingly bad if I were 18. Fourteen-straight losing seasons would be downright awful. But alas, I am 24 and if you do the math correctly, that means the Pirates have not played more than 162 games in a season or finished with a winning record in 19 years. That, my friends, is indescribably bad. The last time the Pirates were winners, gas cost $1.13 per gallon, everyone started buying Discmans and some kids who are in college now weren’t even born yet. But 2012 has been a beacon of hope for the Pirates and their fans. Through the first half of this season, all signs have pointed in a positive direction. Although they were only 10-12 in April, the following months transformed them. In May they went 15-13. In June, they went 17-10. In July, they went 17-9. Winning was no longer the exception, it was the rule. The Buccos spent long stretches in first place in the NL Central and on July 28, they were 16 games over 500. They were officially a playoff contender and even the pundits on ESPN’s Baseball Tonight would talk about the Pirates’ success every night (after they discussed the Yankees of course). Lately, things haven’t looked as bright. August has begun to look like April. So far this month, the Pirates have gone 5-8 and have been outscored 71-59. In their last 10 games, the Pirates are 4-6. In their last 16, they are 6-10. In their last six series, they’ve won one, split one and lost four. But what is making Pirates fans panic most lately is last night’s debacle against the Dodgers. The Pirates suffered their worst loss of the season, giving up 11 runs and failing to score. They committed two errors (and a third should have been counted when Pedro Alvarez let a line-drive deflect out of his glove), were 0-7 with runners in scoring position and stranded six. It was a U-G-L-Y game and one that fans won’t forget any time soon. That loss put Pittsburgh six games back of first-place Cincinnati in the NL Central and they’re now clinging to a half-game lead on Los Angeles and San Francisco for the second wild card spot in the NL. If they lose again to the Dodgers tonight, they could be out of a playoff spot for the first time since July 1. So who or what is to blame for this recent fall from grace? Although there is no one definitive factor that has made the Pirates drop off a bit lately, there are a few things to consider. And to be perfectly clear, the fans in the Steel City shouldn’t panic yet. There are still 46 games left to play and the team is still in a wild card spot. There’s way too much baseball left to make any predictions one way or the other. 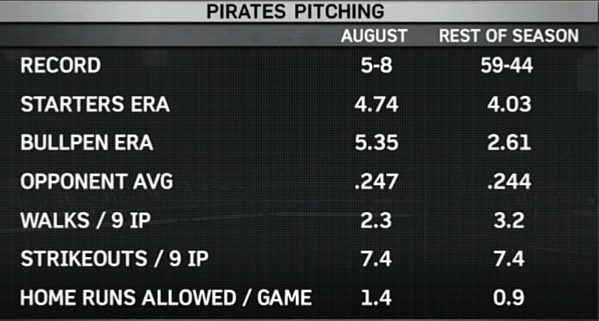 The first thing you might notice is how the Pirates pitching staff has struggled recently. In the last eight days, the Pirates have the worst ERA in baseball (6.25). *In those eight games, the Pirates went 2-6 while giving up 57 runs (50 of them earned). *In that eight-day span, not all Major League teams played eight games. James McDonald, who was considered Pittsburgh’s ace in the first half, has been the biggest underachieving starter lately. Dating back to July 2, he has gone 3-5 and his ERA has jumped from 2.45 to 3.77. His last four games have been some of the worst of his season. In those four, he averaged 5.2 innings per game while averaging a whopping 95.5 pitches per game. In the month of August, J-Mac has notched an ERA of 8.71. The Pirates are currently using a six-man rotation but plan on returning to a five-man rotation on August 23, their next scheduled day off. If McDonald doesn’t improve quickly, he could be swapped from the rotation in favor of someone else and I wouldn’t argue against it. From an offensive standpoint, the Pirates still leave something to be desired. They have the 22nd-best team batting average in the majors (.246) and the 12th-best in the NL. They rank 20th in runs scored in the majors (482) and 10th in the NL. Pittsburgh is also 22nd in league-wide OPS (.709) while ranking 11th in the NL. They still rank 10th in the majors in home runs (130) but it’s clear that the team isn’t hitting well enough. The biggest plate struggles have come from catcher Rod Barajas and shortstop Clint Barmes. Barajas is hitting .194 and Barmes is hitting .213. Barmes is actually swinging a better than we was earlier in the season. In March/April, he hit .149 and in May he hit .189. Both players are every-day starters and they shouldn’t be, especially for their 2012 price tags. Barmes and Barajas are the two highest paid non-pitchers on the team, with Barmes making $5 million this year and Barajas pulling in $4 million in 2012. The Pirates might not have the most viable option to replace Barmes on a more consistent basis. Rookie Jordy Mercer hasn’t proven himself yet (he’s played in only 20 games) but he might be worth a look in the middle of a pennant race because of Barmes’ lumber ineptitude. Barajas on the other hand, has a legitimate replacement backing him up every day. Michael McKenry, a three-year veteran, is hitting .283 and is only starting once every few days. In June, July and August, he is hitting .306, .325 and .360, respectively. The Fort, as he is affectionately referred to in Pittsburgh, has been an exciting young talent to watch this season and has only garnered 152 at bats compared to Barajas’ 242. If Pirates manager Clint Hurdle wants to improve a struggling lineup at the plate, McKenry should be the every-day guy until he shows that he shouldn’t be. That brings me to Andrew McCutchen. It’s tremendously difficult to type a bad word about the guy. He’s been sensational for the Buccos this year, by far the team MVP. He has led the majors in batting average basically all season and he’s a legitimate threat for NL MVP. But I need to cite the fact that he hasn’t quite been the same player since August came along. After hitting .370 in June and .446 in July, McCutchen entered yesterday’s game hitting .289 with a .377 on-base percentage in August. That’s still a better average than all but a few of the Pirates regulars. He has also hit only one home run in August. Don’t get me wrong, he’s still leading the majors with a .359 batting average and that’s really impressive. I no, we shouldn’t expect him to keep hitting .370. But he had a similar cool down last season in the final months and it seems that the Pirates go as Cutch goes. And if the rest of the team is going to continue to bad average as a whole, he needs to keep swinging an unbelievable bat for the Pirates to win consistently. It’s a huge burden on his shoulders, but he’s a star and stars need to help carry a faltering team. If Pittsburgh wants to stay in the playoff picture, McCutchen needs to level off his falling numbers and get back to consistency. With all of that said, I feel it’s important to note some reasons that fans cannot blame for the Pirates’ recent misfortunes. A single perceived turning point like last season. Although there were a number of factors that led to the demise of the 2011 season, many fans will point to the “Jerry Meals incident” as the turning point for the Pirates. After 19 innings, the Buccos lost a game against the Atlanta Braves on a clearly blown call by home plate umpire Meals. 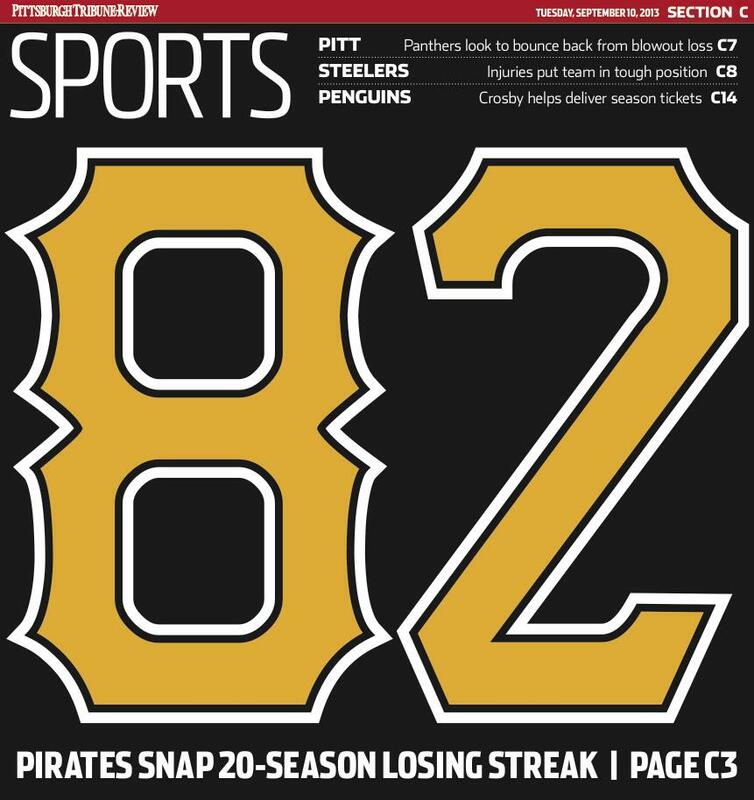 After that night, the Pirates seemed deflated and finished the season 72-90. So far this year, you can’t really pinpoint a single game that has struck a significant blow to the Pirates. 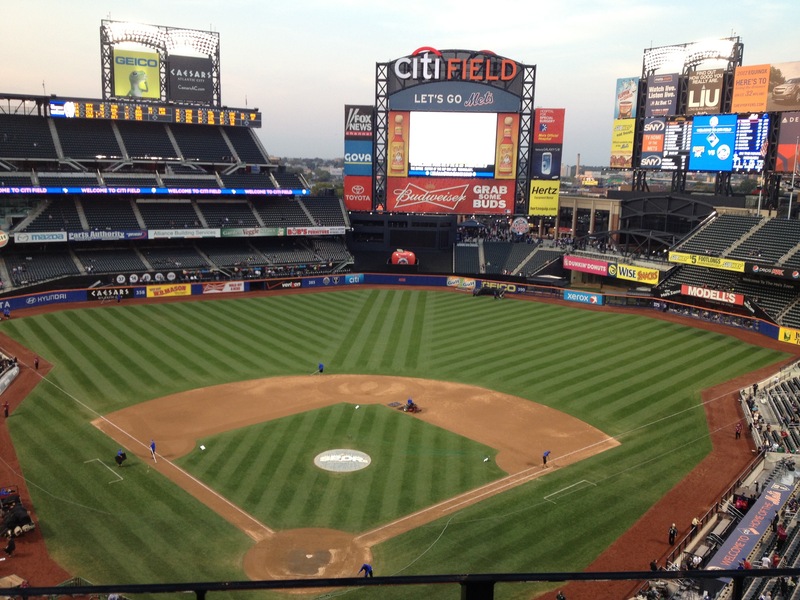 Hopefully, the 11-0 trouncing from the Dodgers last night won’t solidify as a favorite for a downfall. Injuries. This has been a healthy season for the Pirates. Up to last night, they have had the fewest disabled list assignments in the National League and were tied for the fewest in the Major Leagues. They have had only nine of such assignments this season, followed by the Reds (10), Marlins (10) and Brewers (10). The number of errors. What used to be a telling stat of futility for the Pirates is now one of relative success. Through 116 games, the Pirates have committed 71 errors. That doesn’t make them an elite fielding team, but it’s good enough to rank them sixth in the NL and 12th overall in the majors. The standouts have been Neil Walker (fifth among NL second baseman with six), Barmes (tied for second among NL shortstops with 11) and McCutchen (tied for first among NL center fielders with one). Joel Hanrahan. The Hammer has still been a hummer this season. Although the starting rotation has struggled a bit lately and the bullpen hasn’t been what it was in the first half, Hanrahan has been as consistent as ever throughout the season. His velocity has been down and he hasn’t had the control he’d like, but Hanrahan still has the third-most saves in the majors this season (33), behind only Tampa Bay’s Fernando Rodney (37) and Baltimore’s Jim Johnson (34). The Pirate’s closer has blown only three saves this season and hasn’t blown one since July 3 (an 8-7 win against the Astros in which Hanrahan was awarded the win). You may choose to agree or disagree on any of my points, (there are certainly some areas I didn’t have time to address like the Pirates’ recent trades, Pedro Alvarez constantly striking out (he has had 37 multi-strike out games out of 105 played — 35.2 percent), A.J. Burnett continuing to be a stud) but if you’re a Pirates fan, choose to keep rooting for the Buccos. Because you never know the next time they’ll be in line for a post season appearance. And just for good measure, you might want to note that today, gas costs $3.70 a gallon, everyone is buying iPhone 5s and college kids are currently witnessing a winning Pittsburgh Pirates ball club.